You will also notice that to the right of each blue channel fader there are now buttons. These are called routing buttons & allow you to route, or direct the channels to different destinations. The destinations you can route channels to are group 1, group 2, group 3, group 4 & the left & right outputs. Here is an example. If you press the button marked 1 - 2 on channel 1 & channel 1 is panned centrally, that channel will be routed to groups 1 & 2 equally. 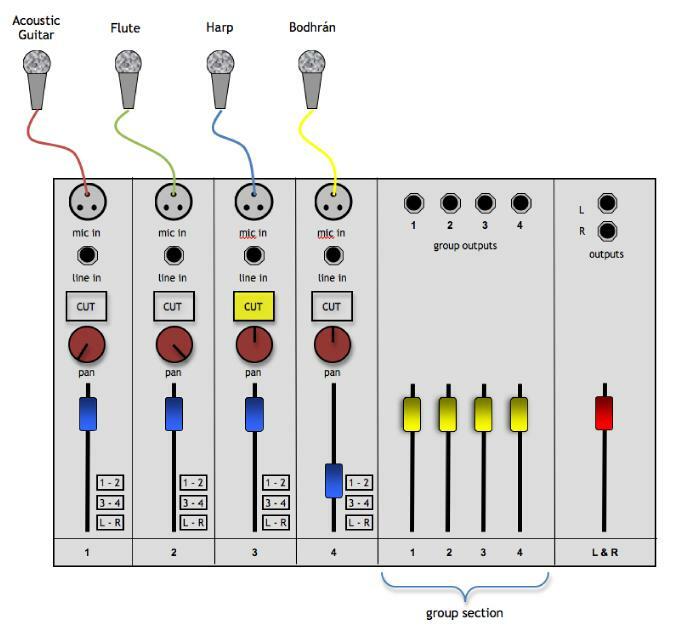 The yellow faders will control the level being output from group outputs 1 & 2. If you pan channel 1 all the way to the left & press the button marked 1 - 2, channel 1 will only be sent to group 1 output. But if you pan channel 1 all the way to the right & press the button marked 1 - 2, channel 1 will only be sent to group 2 output. It is important to realise now that the signal travelling down the channel strip will stop at the bottom of the channel & will nowhere until you physically route it to a destination by pressing the required routing buttons.